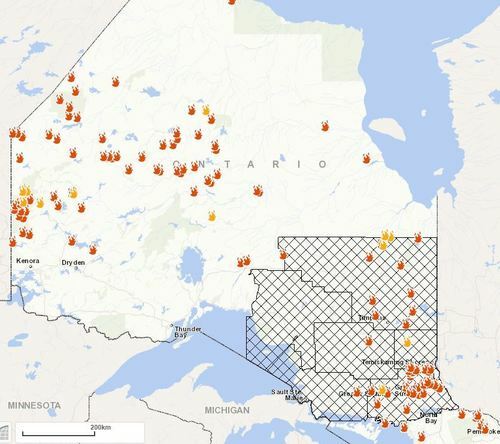 There have been 803 forest fires in Ontario so far this year. At the same time last year, there had only been 190. The 10-year average of Ontario forest fires is 475. McCool attributes the high number of fires this year to the combination of weather like dry conditions, heat and isolated lightning strikes. We'll be back tomorrow with more live blog updates as the forest fires continue to blaze. In the meantime, you can stay up-to-date on CBC Sudbury and CBC Thunder Bay's web pages. Thank you. 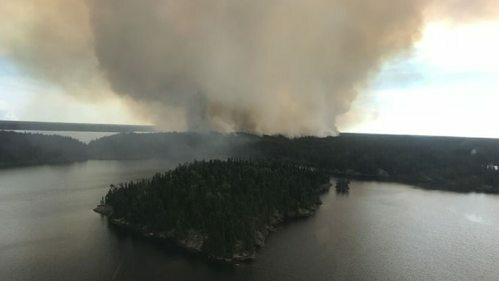 There's stories of some amazing escapes from the forest fires, particularly around Parry Sound 33, that vicious blaze that has charred over 5,000 hectares north of Parry Sound. We've gathered a bunch of them here, including that of Lisa and Jennifer Kivinen. 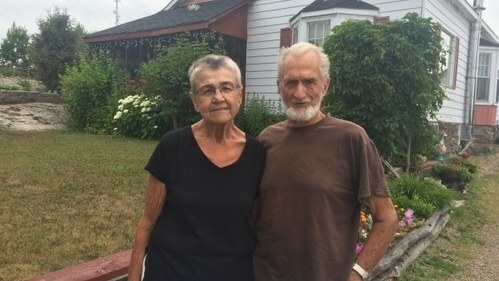 They fled their cottage but are hoping they can get back. "We put our blood, sweat and tears into building this cottage," Lisa said. "That's what we want to do. We want to protect it. We want to save it if we can." When they heard their cottage on the Key River was threatened by a forest fire, Lisa and Jennifer Kivinen jumped in a boat and ventured toward the flames. ... (it now measures 5,612 hectares), it was slowed by the rain. Just keep your fingers crossed for no lightning. 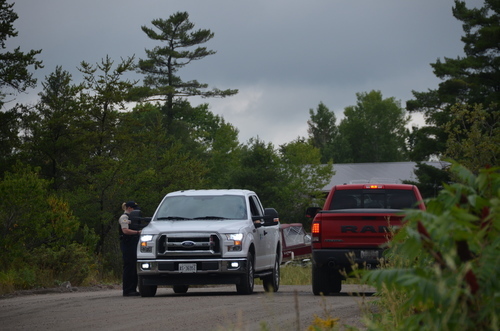 Our reporter Erik White was south of Sudbury today, near the Parry Sound 33 fire. He came across road blocks, tourists and first responders. Take a look. You can read more about this particular fire here. Firefighters from Ontario, Saskatchewan, Alberta, the Northwest Territories, and the Great Lakes region of the United States are working out of a base camp in Minaki, Ont., to battle forest fires near Kenora. One of the wildfires, Kenora 71, has grown to more than 9,000 hectares and is still listed as out of control. Twenty five crews, or approximately 100 firefighters from Ontario, Saskatchewan, Alberta, the Northwest Territories, and the Great Lakes region of the United States are working out of the base camp, according to fire information officer, Chris Marchand. Shayne McCool, a fire information officer for northeast Ontario with the Ministry of Natural Resources and Forestry, just provided an update on the current situation. In the northeast, there are 60 active fires. 28 of those are not under control, while 32 are being held, under control or are being observed. The one he said they are watching the most is that pesky Parry Sound 33 fire we told you about earlier. That fire got some rain today, which is good, but McCool is concerned about the forecast for later this week, when they are expecting conditions to rebound and get dry again. He said it is crucial that the firefighters do their work now, when things are damp, to try and make advances. He is asking the public for cooperation, particularly around evacuations and the water bombers. He said if you see a water bomber approaching a lake, you should move immediately so it can scoop up water. Help has come from all over the country ... including the Northwest Territories. Here are some air tankers fueling up at the Thunder Bay airport. Smoke from forest fires appears to be thinning in parts of the northeast. Isabelle Chenard with the MNRF says billowing smoke could still pose a concern. 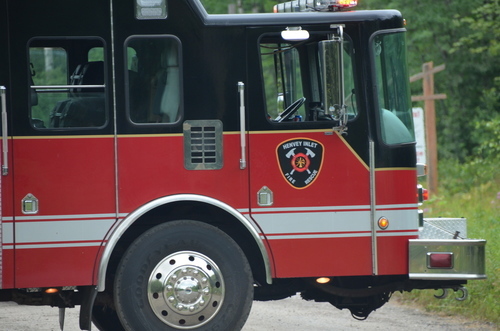 A fire about 90 km south of Greater Sudbury continued to wreak havoc over the weekend, charring close to 5,000 hectares of land and forcing the evacuation of some people. Another provincial park isn't as lucky. 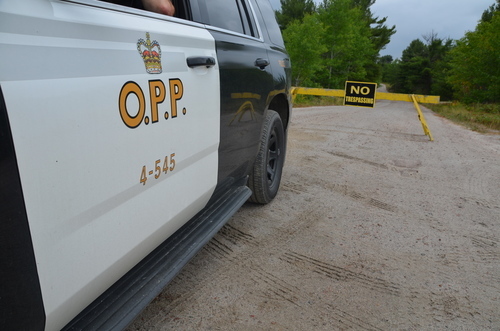 Ontario Parks said that French River Provincial Park and the visitor centre are closed because of the forest fires. "We hope to reopen as soon as it is safe to do so," they said in a tweet. They said interior camping east of highway 69 is still allowed. 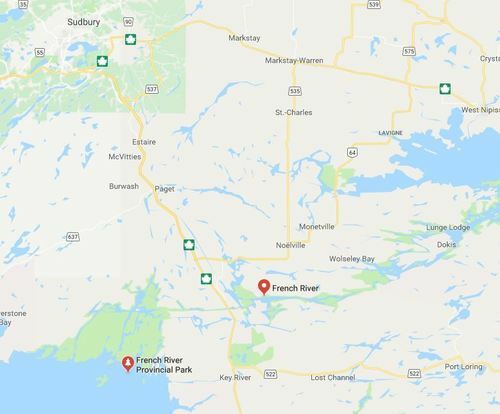 For context, here is French River Provincial Park in relation to Sudbury. It appears cloud or smoke could be obscuring things. I mentioned Grundy Lake Provincial Park in the last post. The park wants to let you know that the fires pose no threat there at the moment. They are crossing their fingers for rain, however. Rain is expected for several areas with forest fires throughout the week, which is a good thing. But thunderstorms are also in the forecast. That means a risk of lightning, which has caused many of the fires to start. Rain started falling this morning as reporter Erik White was driving south of Sudbury. Several forest fires are active in that area, including one by Key River, near Grundy Lake Provincial Park. Much further northwest, two new forest fires have popped up. Both were reported Sunday afternoon and are located in the Red Lake area, north of Caribou Woodland Provincial Park. They are both less than one hectare in size. 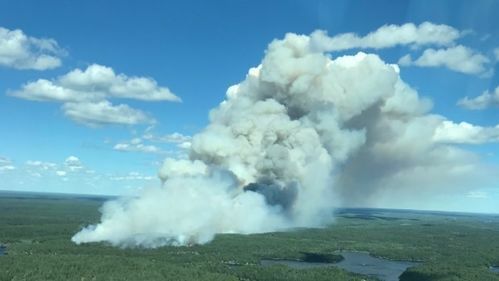 Wauzhushk Onigum First Nation continues to host about 45 members of Wabaseemoong First Nation after the latter was partially evacuated last week due to smoke from a 9,100-hectare forest fire burning nearby. Henvey Inlet First Nation is about an hour south of Sudbury. Our reporter Erik White is there. Dozens of forest fires continue to burn around northern Ontario, including several new ones that have popped up near Sudbury, Parry Sound, Cochrane and Red Lake. Here's the situation right now, courtesy of the Ministry of Natural Resources and Forestry. The orange flames represent the active fires, while the yellow ones represent new ones.